Why is he pointing his finger in every single one? A few minutes ago, I was browsing my sources to perhaps find something to post about. One of those sources happens to be Facebook, and I noticed that Peter Jackson had changed his cover photo. In it, he was talking to Lee Pace in character as Thranduil, and Peter was pointing to something out of the bounds of the image. In the previous cover photo, he also was directing his finger at something we couldn't see. 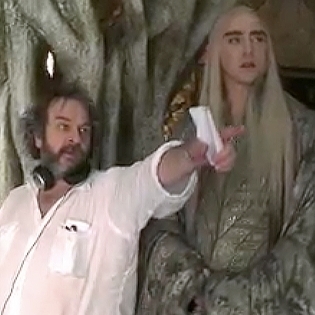 In all, there are three photos in which Peter Jackson is pointing his finger. Why? I hope you did not take me too seriously on this post, because I was not being all that serious. Still, I do find it interesting that Peter Jackson is pointing in three of his cover photos. He is a director, so I am sure he does it a lot, but why in his cover photos? If you have any other ideas, be sure to leave a comment!